Toadily Toads - the place on the web dedicated to toads. 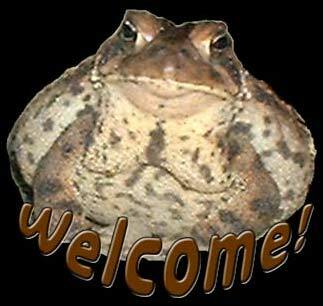 Toad care, toad information, bufo americanus care, bufo marinus information and more. 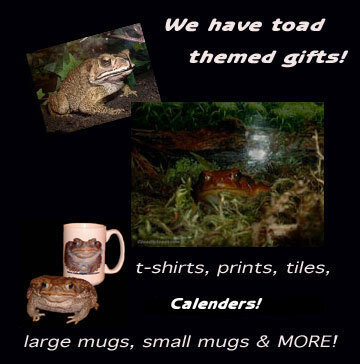 Toad gifts specific for toad lovers. Plus global amphibian crisis information. Welcome to Toadily Toads! The place on the web where toads come first. Introducing, the all new Toadily For Kids! 2008 WAS the Year of the Frog! Please visit the website of the Amphibian Ark Project and learn what YOU can do to help the global amphibian crisis taking place right NOW! Please help us to help toads. Support this site.Come visit our very cool and ever growing store at Cafe Press to find fun toad related stuff. Anything you buy from our store helps pay for the web hosting and domain renewal. Help us help toads. Buy something nice today and help a toad in need! Thought provoking article and ideas on how YOU can make a big difference to the global earth and amphibian crisis! URGENT! Learn the TRUTH about the Cane Toad problem in Australia! All New Section - Toadily Good Karma! Do good for toads, Earth and humankind! The all new vitual awards! See who earned the Toadily Toads Earthian Award! NEW! A review of the childrens books by Frogdaze.com's Carole Tobey! * How to tell a male from a female toad! You asked for it. Here it is! * Toadily Toads article and images of toads in the house's window well! A gallery of excellent photos of our toad, Melanie, a bufo melanostictus! Toadily Toads Frequently Asked Questions! the Dwarf African Claw Frog! Pebbles the Pacman Frog Gallery! A new word search puzzle has been added. Try solving Kisco's Wordsearch Puzzle 3 in our Toadily Fun section! Added long ago: Toadily Toads Media Review of the Harry Potter Series! Singing Rococos! YAAAH! NEW and UPDATED! The long awaited Rococo Toad care questions and answers!!!! Added ages ago: Tomato Frog Gallery in the Photogallery section! Added ages ago: Rococo Toad Gallery in the Photogallery section! FUN new features have been added on the Toadily For Fun page! Vote now in Kisco's poll! Technical stuff: This website is dial-up friendly! We have optimized all graphics and have tested this site on slow dial-up connections to be sure the site and images load fairly quickly. Depending on your connection, your speed might vary. If we could afford high speed access we would, but in the meantime, we want to be sure that none of our friends out there, nor us, have to suffer the pain of excruciatingly slow load times. Furthermore, we promise this site will never contain slow loading, browser crashing, flashing, blinking, annoying animated GIFs (though we cannot be responsible for Bravenet content which is designed and hosted by a third party). This site was designed to view best in Netscape 7.02 or Mozilla (same thing, basically). Finally, we promise that at no time during your visit will you be frightened out of your wits by the sudden intrusion of an imbedded sound file. It is safe to leave the volume up! toad lover to visit this site! Get cool FREE tools for your own website with Bravenet.com and help us to help toads and frogs! How? Just click below and join Bravenet. We earn a referal fee for each person who joins Bravenet to get their own free site tools! Its that easy! All proceeds will go towards hosting and domain renewal fees for toadilytoads.com to keep us online and helping toads.